The Mozilla Foundation has unveiled a first tablet running Firefox OS. Indeed gave some details on dedicated equipment yet to developers. 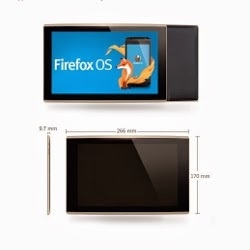 After smartphones, Mozilla aims the tablet market with its operating system Firefox OS. On its blog Asa Dotzler, community coordinator of Firefox at Mozilla, presented the characteristics of the tablet Infocus New Tab F1. It boasts a size of 266 mm long by 170 mm wide and 9.6 mm thick. For the processor part, there is a A31 processor (ARM Cortex A7) 1GHz and a PowerVR SGX544MP2 graphics chip. If the RAM is 2 GB flash storage space is limited to 16GB screen is more classical, 10.1 inches (IPS), multitouch with a resolution of 1280 x 800 pixels. Side photo, F1 is equipped with two sensors 2 and 5 megapixels. In terms of connectivity, it has a micro SD slot, micro-USB connector and a headphone output. Network side, there is WiFi and Bluetooth, but no radio chip for 3G or 4G. Finally, a battery of 7000 mAh complete everything. Mozilla says that, at first, this tablet will be reserved for developers before being marketed.